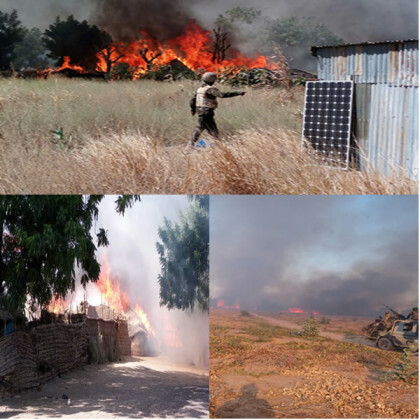 Troops operating in Bama axis on a fighting patrol today cleared Boko Haram terrorists out of Aulari general area located within the Sambisa forest. The troops cleared all the 4 camps located within the area that includes Faldan, Kidiziromari, Kuroshini, Kurumari and Ngulda. One Boko Haram terrorist was killed while trying to escape and about 31 persons were rescued from the terrorists. The troops discovered stockpile of farm produce in metal drums, sacks and underground storage facilities. Other items recovered included several bicycles and motorcycles. Some of the farmlands yet to be harvested were also set ablaze by the terrorists. A wooden rifle used for training and practice by the terrorists was also retrieved. In a related development, troops of 7 Division Garrison conducted 8 fighting patrols along Leje Axis. The troops cleared the area and about 15 other villages around Leje. They include Khadadamamari, Ladin Buta, Hilmari, Kashauri, Keshan Ngala, Aiwa, Masu Kura, Mabirni, Grza 1 and 2, Mashuari, Dubenge, Tauba and Majande. Troops also pursued and destroyed 2 Boko Haram terrorists on motor cycles. Troops have also blocked all known routes to prevent Boko Haram Terrorists from transporting livestock across borders. All these are with a view to stopping the Boko Haram from fueling their terror machines through cattle rustling and illegal trading. As we continue our push to clear all remaining elements of Boko Haram terrorists we call on law abiding citizens of the country to continue providing security agencies with credible information about all known and suspected terrorists.